Each June, the University of Portsmouth hosts a week long GameJam. It’s 35 hours in total, and the themes are picked at random from Wikipedia. The 2016 themes were Canadian Masterchef, Water Jousting, and Sickle Cell Anemia. 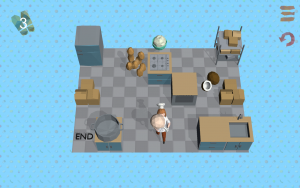 We decided to go for just MasterChef and designed a game around a kitchen theme. The basic idea is that you need to collect up to four ingredients from a maze, and then get to the end. The catch is that once you start moving, you don’t stop until you hit a wall. It’s a lot like the ice floor puzzles in Pokemon Gold&Silver, but with additional elements added in and high scores for completing in under a certain number of moves. 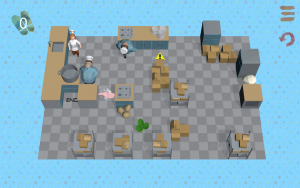 In later levels there were tiles that could only be crossed once, and NPC chefs that would move and block your way. We had found success before when making a turn based puzzle game, so decided to go down that route again. The advantage of a puzzle game in a GameJam is that you can make many levels very quickly, once the mechanics are implemented. Although we wanted to have a TXT based level system that would be parsed in Unity, we didn’t implement it in time so there was a mad rush on the final day to put together the levels manually that we’d scribbled down on paper the day before. It was a game that was both fun to try and play, as well as watch other people try and solve. We managed to win “Best Overall Game” from the judges, as well as the “People’s Choice” award. 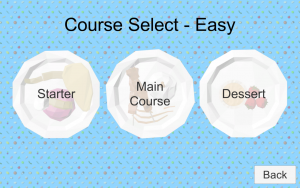 Additionally, because we had a main menu with a level select screen, and multiple levels, the judges made up a new category just for us, the “Most Complete Game”. We were super happy that people enjoyed the game, and have since started working on making into a full game for release on Google Play.